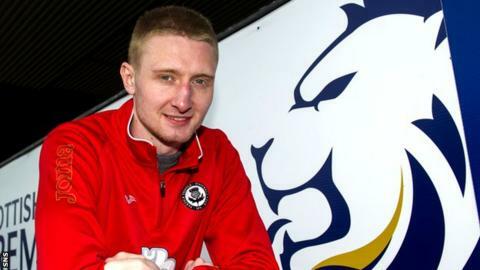 On-loan Partick Thistle midfielder Chris Erskine says he wants another chance to show what he can do at his parent club, Dundee United. Erskine returned to Firhill in January after failing to make an impact at United and hopes to help Thistle avoid relegation. But he expects to return to Tannadice in the summer. "I think I've not really had a chance in the first place, never mind a second chance," he told BBC Scotland. "I started four games up there, which I don't think you can really call that a chance to be perfectly honest. "I had a wee injury as well and that didn't help me to show the form I can show. "I am starting to show here I can definitely play in this league, so it would be nice to get a wee chance." Erskine had been plucked by Thistle from junior football with Kilbirnie Ladeside in 2009 and then followed manager Jackie McNamara to Tannadice in the summer. "I was sitting on the bench a bit much at United and it wasn't something I wanted to do," said the 27-year-old. "I wanted first-team football and I've had a lot of it here. "I think the plan is to go back up there. I think, at the end of the day, it is going to be in Jackie's hands whether he wants to keep me or not. "I've not really spoken to him about it."